Ritesh Batra's directorial debut, DABBA, is the most wonderful, unique, affecting film. It's that movie that you hope for every festival: the unexpected show stopper. He has created characters that I've taken to my heart: a love story so delicate, so fragile, so darkly comic that you want it to never end, but you're so pleased when it does. Because Batra knows how to end a movie: without sentimentally and without being obvious. It's masterful. So what's it all about, Alfie? Irrfan Khan plays a grumpy old widower, a month short of his retirement, who accidentally receives the lunch tiffin intended for the husband of a neglected young housewife. Tentatively at first they start a correspondence consisting of notes tucked in the tiffin, expressing their dissatisfactions, hopes and musings. Through opening up to her, the old man becomes more open toward life in general, befriending the young co-worker he'd initially cold-shouldered. Through him, she gathers the courage to look for a better life with her daughter. This all sounds so deceptively simple. How can I explain the humour of seeing the woman's relationship with an entirely unseen "auntie" who lives in the flat upstairs and dispenses sage advice and chillis in a basket? How can I explain the brilliant hilarity of a tiffin-delivery man protesting to the woman, eager to track down her correspondent, that tiffins simply cannot be misdelivered because men from Harvard have been to examine the system. But this movie is more than its humour. It's the private pleasure the woman takes in preparing her tea and reading her letter, to sound of old Bollywood love songs played in the flat above. It's the lifelong devotion of Auntie to her husband. It's the beautifully drawn character of Shaikh, the widower's young colleague who has overcome so much prejudice to make a joyful life for himself. It's the fragile hope that we, the audience, have, in seeing the widower refuse to become an old man. I love that Ritesh Batra trusts us, the audience, to be content with the delicately essayed rather than the grindingly obvious. I'm so pleased that there's no Western equivalent of the "dabbawala" phenomenon. It means that we won't get a schmaltzy Hollywood remake of this wonderful, truly memorable movie. 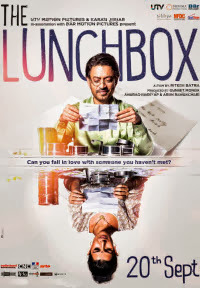 DABBA aka THE LUNCHBOX has a running time of 104 minutes. DABBA played Telluride, Toronto and London 2013. It was released earlier this year in India, and opens in Germany on November 21st and in the Netherlands on December 12th. just saw the movie & found nothing less from the review.